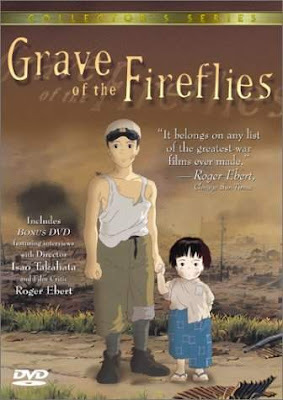 Grave of the Fireflies (火垂るの墓, Hotaru no Haka?) is a 1988 anime movie written and directed by Isao Takahata for Shinchosha. This is the first film produced by Shinchosha, who hired Studio Ghibli to do the animation production work. It is an adaptation of the semi-autobiographical novel of the same name by Akiyuki Nosaka, intended as a personal apology to the author's own sister. Some critics—most notably Roger Ebert—consider it to be one of the most powerful anti-war movies ever made. Animation historian Ernest Rister compares the film to Steven Spielberg's Schindler's List and says, "it is the most profoundly human animated film I've ever seen."